PRO-CAST® Series Precision Casting/Coating Machines are routinely used worldwide to produce thin and thick films and layered products to precise tolerances using solvent or aqueous based slurries. To successfully produce ceramic, metal and composite tape cast products from viscous formulations (usually > 1000 mPa*s) continuously at rapid rates, requires a machine that is designed to meet the latest state-of-the-art specifications. The PRO-CAST® Series machines integrate a sturdy structure with a solid, level platform that uniformly supports the moving carrier casting/coating surface. In addition, PRO-CAST® machines have a proven facility to deliver conditioned fluids consistently to the casting/coating surface. One casting/coating method is with an adjustable doctor blade assembly with a micrometer adjustable gap positioned on a precise casting/coating surface, which has been ground and certified to a tolerance of at least ± 0.00026″. 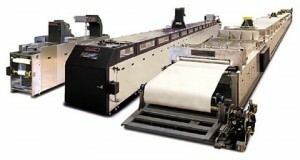 Precise, smooth control of the carrier or web speed is also essential to insure uniform films. This is accomplished with the use of a microprocessor controlled digital drive and closed loop feed back system.